The authors of this letter are journalists, columnists, bloggers and content publishers for the workers’ compensation industry across the United States. We are a politically and professionally diverse group. We do not agree on everything, yet find ourselves of one opinion on a highly critical matter. We are competitors who are now colleagues for a common cause; to bring light to a serious injustice being committed within your state. The prosecution of Charles (Sandy) Blunt was, in our view, an outrageous and almost farcical event. It is, in the final analysis, a travesty that has damaged the national view of your state, hampered the operation of a State agency, and ruined the life of a good man wholly undeserving of such results. During his almost 4 year tenure his agency spent approximately $11,000 on employee incentive items, including flowers, trinkets, balloons, decorations and beverages for Workforce Safety and Insurance employee meetings, and on gift certificates and cards in small denominations for restaurants, stores and movie theaters. Blunt personally approved some of these expenditures. Others were made by managers as part of daily operations under his watch. Not a dime went into an employee’s pocket, nor did Blunt personally benefit from any expenditure. His agency paid $8,000 to an employee, David Spencer, for sick pay when he was not apparently sick, and it also failed to collect $7,000 from Spencer when he left prior to the end of his employment agreement. The $7000 was for moving expenses incurred that prosecutors felt Spencer owed the state. Blunt’s position was that the agency was not entitled to collect these funds, since Spencer’s departure was not voluntary. All told, the state prosecuted Sandy Blunt, and he is now a convicted felon for “misspending” $26,000 of government money. No one has ever alleged that Blunt personally benefited from any of these expenditures. Blunt was acting like other capable, ethical North Dakota executives ‐ in the best interest of customers and of the mission of his employer. In our industry it is considered a best practice to provide employees and supervisors with incentives. It is not frivolous, it’s necessary, and what every employer should do. The first of these two charges would be, to many people, laughable if it were not for the damaging consequences associated with them. The notion that buying inexpensive incentive items for your employees could result in a felony conviction is simply stunning. This would not be elevated to a criminal status in most states in the nation. The fact that it is in North Dakota should have a chilling effect on businesses looking to move there. Withholding of evidence by prosecutors is one of the most serious acts of prosecutorial misconduct in North Dakota and all other states. In recognition of this, the panel recommended Ms Feland’s license to practice law be suspended. We urge that you read the entire report of the panel, including the penalties the board recommended be imposed on Ms. Feland. For the report, go here. Had the prosecutor not withheld evidence, in all likelihood the case would never have come to trial, and the reputation of Blunt and the WSI would be free of taint. The evidence in question shows that WSI’s auditor’s own findings backed Blunt’s position on payments related with Spencer. However, those findings were not made available to the defense, and the prosecutor was found to have allowed testimony to be given at the trial that directly conflicted with information she had. As we indicated, Feland, now a judge in your state, has been recommended for suspension and a fine over these findings. Yet Sandy Blunt remains a convicted felon. His crime? Buying balloons, trinkets and $5 gift cards – for his employees, not for himself. For that, Blunt, who is married with two children, has had to spend half a decade, and untold thousands of dollars trying to clear his name. Some of us have known Sandy for quite a while. Some have come to know him while learning of his situation. Others of us have never met Sandy, but recognize the tenuous nature of his treatment. Collectively we speak to thousands within our industry every day. Our opinions have been clear; this situation needs the light of truth shone brightly upon it. The time and resources expended prosecuting a man on such questionable grounds should be more closely examined, by the business community, workers compensation professionals and the media in North Dakota. Sandy Blunt is a good and decent man. He deserves better. So, it would seem, do the people of North Dakota. Lynch, Ryan & Associates, Inc.
Is justice on the horizon in North Dakota? Gary Schwitzer makes his hosting debut with Unwrapping early presents, wrapping up ’11 Health Wonk Review series. Gary is the publisher of the excellent HealthNewsReview.org and its associated Health News Watchdog blog – take a look around while you are there. Absence Management – The Disability Management Employers Coalition and Liberty Mutual recently released a set of best practice for absence management and easing the transition back to work after a disability leave. Download a whitepaper on Best Practices in Return to Work or view Taming the Intermittent Beast, a one-hour webinar on managing intermittent leave. Support a good guy – Joe Paduda explains why you should join the Friends of Sandy Blunt on LinkedIn. Up in smoke – Roberto Ceniceros posts about a denied claim involving a landscaper injured after a fall from a tree. Ceniceros notes that, “A urine sample taken at the hospital the day after the Tennessee man fell showed he had an intoxicant level 50 times beyond the threshold for a positive result, leading a doctor to describe him as a chronic pot user.” The court concluded that while the employee was not guilty of willful misconduct, his intoxication was a proximate cause of the injuries. Hope for PTSD relief? – Wired has an interesting article on a how the Navy is testing neck injections to relieve PTSD. The unorthodox procedure, which is called stellate-ganglion block (SGB), has secured immediate relief for some PTSD sufferers. NYWCB Web change – Effective December 20, the New York State Workers’ Compensation Board (WCB) updated its website to use the standard “ny.gov” domain naming convention – the new web address is www.wcb.ny.gov. 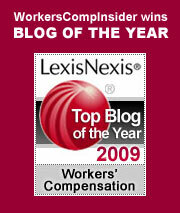 WorkersCompensation.com has more detail about related email changes. In honor of the holiday season, we’ve put together a grab bag of some fun holiday links. We wish all our friends the best for the season! Singing Christmas Hedgehogs – a cute interactive feature which shows that the holiday season is hard on hedgehogs! Tesla Christmas Tree – impressive, but don’t try this at home! Insurance Writer Nancy Germond hosts this week’s edition of Cavalcade of Risk and she has a seasonal theme: The Turkey Edition. Check it out. Reminder – Tomorrow is Great American Smokeout day. More than 46 million Americans still smoke and if some of them are your employees, it is likely that smoking is taking a financial toll on your organization. It’s not too late to remind your employees: here are some printable tools, or you can just email a reminder about 1-800-QUIT-NOW, a free smoker’s quit line. Other notes from last week’s Las Vegas Workers’ Comp Expo – Kudos to Peter Rousmaniere, who collaborated with Sedgwick to produce a great video on the history of workers comp – we’ll bring it to you as soon as it’s available online. Our fellow blogger Joe Paduda kicked off the show with an informative opening general session, part of which was a Point/Counterpoint style sparring between Joe and David North of Sedgwick and Davidson Pattiz of Zenith about pricing and billing transparency. You can see Joe’s reports from Vegas here and here. Evan Falchuk was part of a panel on expert physicians. Falchuk is President and Chief Strategy Officer of Best Doctors, an organization that has been making quite a splash on the healthcare side. (Check out Falchuk’s blog, See First). While not as widely known as their general healthcare services, Best Doctors also offers services in the workers comp arena, which include help for legacy claims, complex care claims, and cases involving chronic pain, among other services. Chris Brigham of Impairment Resources made an impassioned presentation on how we can and should be making a commitment to prevent the needless disabling of injured workers. He and his team were also exhibiting, side by side with their partner firm and our neighbor, Insurance Recovery Group, who were touting their subrogation services. Other sightings: Colleague Jim Paugh was representing his new predictive analytics endeavor, WorkersComp Analytics; Mark Walls was the man of the hour, moderating sessions and hosting a reception for members of his popular linkedIn Work Comp Analysis Group; We also spotted Bob Wilson, another online pioneer, and were fortunate to spend time with Helen Knight of King Knight Communications, arguably the best PR person in workers comp; and a shoutout to Frank Pennachio (erstwhile guest poster) and Susan Toussaint of Work Comp Advisory Group, who we finally met in person. Finally, congrats to Nancy Grover, program chair, along with all the advisors and staff of LRP and Risk & Insurance for putting on a good conference. Check out the Rocky Mountain High Edition of Cavalcade of Risk. Louise of Colorado Health Insurance Insider produces a great compendium of recent “best of the web” risk posts on a variety of topics ranging from the ubiquitous health care debates to investing and long term insurance. It’s a great way to get a sampling of several blogs. Plus, Louise and Jay’s blog always offers a refreshing street-level view of issues related to health care. They offer a wise take on the big issues but also offer good advice on everyday health issues: If you ever get a rock stuck in your nose…”. A good man wronged – Joe Paduda has been fighting the good fight for Sandy Blunt, former North Dakota state work comp fund CEO. Blunt had a recent setback when the Supreme Court affirmed his felony conviction, but more recently we learn that the prosecutor is under investigation for prosecutorial misconduct in the case. One of the charges against her is allegedly withholding exculpatory evidence from Blunt’s attorney. (If you aren’t familiar with the Blunt case, see Peter Rousmaniere’s article Blunting Political Vindictiveness or plug “Blunt” into Joe’s search feature and catch up.) We had the good fortune to meet Blunt at an industry symposium prior to all these events – he was on fire with his commitment to overhaul the ND agency, to inspire employees and employers alike, and to ensure the best possible care for injured workers. Innovative, energetic, creative – by all accounts, he was making a significant positive impact. Then came a series of surprising charges resulting in his ouster. As we’ve noted before, most of these charges were minor, trumped up administrative issues, such as spending a few hundred dollars on lunches and gift certificates to motivate staff – practices that were not uncommon in other state departments. Other more serious charges were dismissed or shown to be erroneous – and now we have potential prosecutorial misconduct being investigated. ADA at 20 years – It’s been 20 years since the Americans with Disabilities Act was signed into law, a groundbreaking initiative which afforded unprecedented public access and workplace protections to the disabled. All those parking spots, wheelchair ramps, wider doorways, and sloped curbs? They didn’t exist a few decades ago. For a commemorative featuring recent news stories, commentary and employer resources, see HR Web Cafe: The ADA at 20 Years. Calling Uncle Sam – Is the workers comp system broken for occupational diseases such as the ones that are likely to result from the BP oil spill cleanup? Peter Rousmaniere thinks so – the feds have had to bail the system out in two prior catastrophes within the past decade. He makes the case for federalizing occupational disease in his column at Risk and Insurance. Walking the walk when it comes to obesity – Employees at Total Medical Solutions are taking their role as health care providers to heart and taking a leadership stance when it comes to doing something about obesity. In the last three months, 25 employees have shed a total of more than 400 pounds, and achieved good local press for their accomplishments. We were reminded of seeing this story when we read Roberto Cenicero’s post on the biggest loser, corporate edition, which talks about a competitive challenge several of Minnesota’s largest corporations have embarked on. His post also links to a recent study from Integrated Benefits Institute on “health and productivity management” practices at 450 U.S. companies. Quick lesson in how to save $550,000 – Discouraging employees from filing a workers compensation claim for an on-the-job injury is a no-no. Just ask Rawley’s of California how they fared in a recent criminal investigation, which revealed that some managers were routinely telling injured employees to use their own insurance rather than report injuries to the state. The first Cavalcade of Risk of the new decade has been posted by Louise of Colorado Health Insurance Insider – check it out. And while you’re visiting the Cavalcade, why not check out the rest of the entries on the C.H.I.I. blog? We don’t live in Colorado, but if we did, we’d definitely be doing business with Jay and Louise Norris. Sandy Blunt and the goings on in North Dakota – Good for Peter Rousmaniere and Joe Paduda for shedding light on the travesty of a prosecution related to Sandy Blunt, former CEO of North Dakota’s Workforce Safety and Insurance. I met Sandy Blunt at a conference in DC a number of years ago and had been following the turn-around he was effecting in North Dakota’s system. He struck me as progressive, innovative, and very sharp – it seemed a real coup for North Dakota to have his services. Then came a series of surprising charges resulting in his ouster. In following the case, it appears that most of these charges were minor, trumped up administrative issues, such as spending a few hundred dollars on lunches and gift certificates to motivate staff – practices that were not uncommon in other state departments. Other more serious charges were dismissed or shown to be erroneous. Blunt has appealed his conviction to the state’s Supreme Court and we hope he will prevail. Insurance Fraud – Emily Holbrook of Risk Monitor posts about a spike in insurance fraud as indicated by a recent report from the Coalition of Insurance Fraud: “Overall, the economy in 2009 appears to have had a significant impact on the incidence of fraud. On average, fraud bureaus reported the number of referrals received and cases opened increased in all 15 categories of fraud included in the survey.” Unsurprisingly, the biggest number of fraud cases occurred in the category of bogus health insurance. Popcorn flavorings vs public and worker health – Celeste Monforton of The Pump Handle provides an update on a public health issue of concern to workers and consumers alike: butter flavorings in popcorn. After a public outcry about diacetyl flavorings, which were causing worker and consumer health problems, the industry began substituting a product labeled as “no diacetyl.” Preliminary reports from NIOSH indicate that these chemical changes do not translate into less health risk to exposed workers and consumers. Work violence – Does the economy play a role in workplace violence? That’s a question posed by the Christian Science Monitor in the light of a recent shooting rampage by a disgruntled worker of manufacturer ABB Group in St. Louis that left three dead and several wounded. One factor that the article did not reference is the stress that many people feel post holidays. This story brought to mind a post-holiday workplace shooting rampage in Massachusetts a number of years ago involving another disgruntled employee.